Let's face it without a roof on your new home it is not fit to live in, but before you assume that the roof is just a timber and tile construction think of the options you could chose to have at the top of your house. There are a wide variety of tiles that can be used to cover the roof. Quite often you will be limited in your choice, as you may have to blend in with other houses in the vicinity. Either way the building control officer in the local planning office will wish to see a sample of the tile you intend to use along with a sample of the brick for the main structure. You may wish to use slate for the roof, again this would have to be passed by the planning department. A popular addition to homes is the loft window. Why not fit them when the roof is being constructed it will be easier at this stage. The space under the roof area is very large and is quite often wasted as a storage area for unwanted family junk. By ordering a specially designed framework you will have an instant room in the loft space. It is the felt and battening underneath the tiles that seals the roof against the elements. 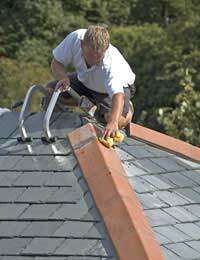 Never scrimp when fitting your roof always use an expert roofer. If the roof leaks it will cause untold damage to the property. By employing an expert it will ensure a quality job is done and it will also be guaranteed. The days of spotting a roofer running up a ladder with a pile of tiles on his head are long gone. These days scaffolding will have to set up at roof level before anyone is allowed to go up and work on the roof. While the scaffolding is in situ it would be prudent to install any satellite dishes, aerials, solar panels etc. Remember first that you may need planning permission for some of these additions. If the roof joists are being delivered ready-made they will likely arrive on the back of a flat bed lorry. The offloading will require the use of a crane, which could hold up the traffic if you are building in a built up area. You will need to enquire at your planning office about a licence to close the road during delivery. Traffic lights may need to be installed or a worker who is able to control the traffic. Hard hats will also need to be worn during the delivery and construction. Always choose the best insulation that you can afford. There are Eco-friendly types as well as standard products. Always use safety goggles and mask when handling insulating material as it can irritate the skin and eyes. If at a later date you intend to use the area under the eaves as a room site any water tanks and piping in a place where it will not have to be moved again. Run the pipe-work for a radiator will also save time and inconvenience later. A good quality loft ladder will be needed to gain access to the loft space. Ensure that it can be used easily. If at a later date the area will be converted to a room you will need planning permission to fit a set a staircase. By considering this when you build the house it will save time and expense drawing up plans at a later date. The roof space in your home should be considered carefully at the design stage as it can add value to the home as an extra room.